It has been revealed that Venom has two post-credit scenes. 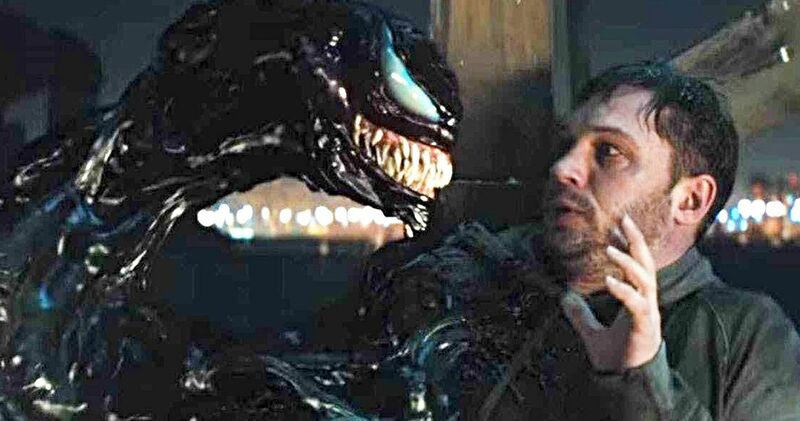 The Tom Hardy movie hits theaters this week and Marvel fans are dying to know how the movie is and if it includes Carnage. While there have been some complaints amongst comic fans that the film is only rated PG-13, it looks like it’s going to push the envelope for that rating, as evidenced by the promotional material. Venom looks like a dark and violent take on the iconic character, which should make many comic book fans very happy. Venom has started to screen and there are two post-credit scenes. The specifics of those scenes cannot be talked about at this point in time, but fans are urged to stick around to see them. Both scenes take place after the credits, there is no mid-credits scene, so make sure you stick around for both of them at the very end of the film. The style is a bit unorthodox from the way Marvel normally does things, but even the Marvel Cinematic Universe deviated from the trend with this year’s Infinity War. Tom Hardy has been out promoting Venom full time over the last few weeks, and he’s excited for fans to see the movie. Hardy’s Eddie Brock is big departure from what we’ve seen on the big screen before, but fans are worried that they’ll be just as unsatisfied after the movie premieres as they were the last time that the symbiote was in theaters. Additionally, since most of the promotional material for Venom takes place within the first half of the movie, there’s a big question mark about whether or not more symbiotes arrive on the scene. Questions aside, there is also a lot riding on Venom for the future of the Spider-Man villain universe that Sony has. Morbius the Living Vampire is the next project to go into filming, but it could be thrown out of orbit if Venom tanks at the box office. With that being said, the film is already tracking to do much better than expected, which means that Jared Leto should have no problem getting into the Morbius character in the next few months. Morbius news is expected to drop very soon. Venom hits theaters on October 5th, which is only a few short days away. The mystery will finally be lifted and Marvel fans will know if Ruben Fleischer and Tom Hardy did the character justice. If all goes well, a sequel will be coming down the wire, which may or may not be teased at the end of the movie. Again, you’re just going to have to wait until the end of the film to find out. It will be very interesting to see how a Venom movie performs without having Spider-Man involved, much like seeing the Joker movie without a Batman. While we wait to find out, you can head over to Sony Pictures to get more information on Venom.